School Programs - Planet Aid, Inc. Planet Aid's local offices work with schools, youth groups, and community organizations to raise environmental awareness and inspire participants help make a difference in the world. 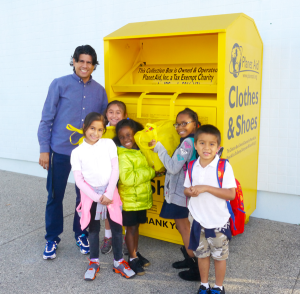 Thousands of schools and other organizations across the United States already host a bright yellow Planet Aid recycling bin, which not only makes it easy to reduce waste but also serves as a humble reminder of the good that can be done in the world. A Planet Aid textile recycling bin is one element in our varied program offerings. For example, our knowledgeable staff can come to your classroom to make a presentation that helps students to understand what recycling is all about and why saving resources is vital to both a healthy planet and the people that inhabit it. Planet Aid representatives will visit your classroom to give a presentation on recycling and related topics. Your classroom or school can help support people and communities in developing countries. A great service project that will give students a global understanding of recycling and development. Planet Aid is a sponsor of the National Green Schools Society. Students can complete their service project requirements by working with Planet Aid on a recycling initiative.